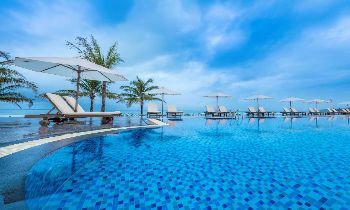 Phu Quoc Island is one of the famous destinations in Vietnam with a lot of beautiful and attractive places for traveling. 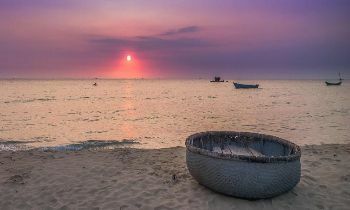 Furthermore, the place is also famous for the longest cable car in Hon Thom Island in Phu Quoc. 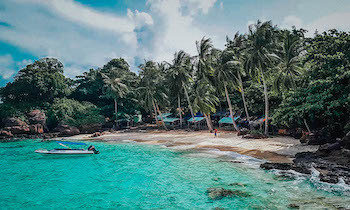 The newly opened cable car route connects Phu Quoc island with Hon Thom which is a genuinely breathtaking experience. 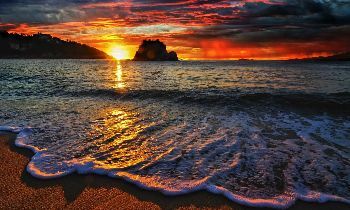 Riding on the cable car, you soar over a turquoise sea and islands with an amazing view. 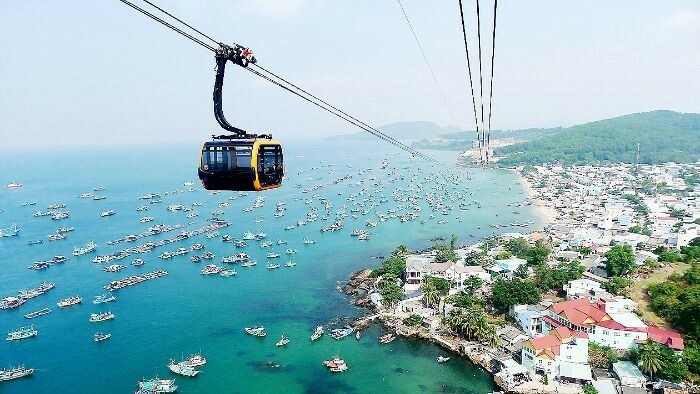 With the length of 8 km, the Phu Quoc cable car route is the longest non-stop three-way cable car in the world recorded by the Guinness Book of World Records. 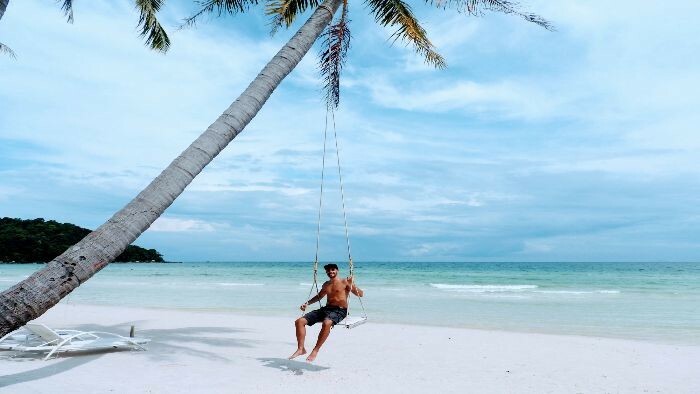 When visiting Hon Thom Island by cable car, tourists will have amazing and unforgettable time because you will have a chance to admire the whole beauty of Phu Quoc Island from the sky. 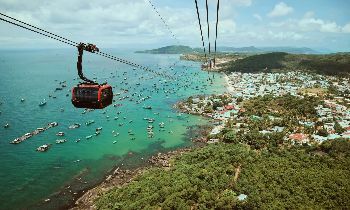 The journey to the top with the Hon Thom cable car gives visitors an exciting experience, when 360 degrees of sea and sky is collected and watching the painting in South Phu Quoc is portrayed with natural colors in the best and the liveliest. 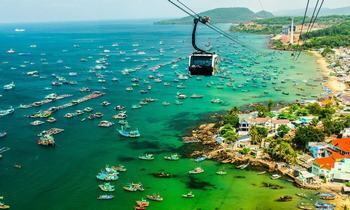 The cable car will take you from the main island of Phu Quoc to Hon Thom Nature Park on Thom island. 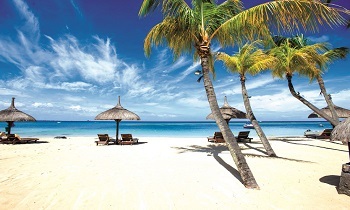 There is a small lovely beach featuring a fun jumping castle style playground in the water, deck chairs, and swings from the palm trees. Water is so turquoise and clear with the small gentle waves. The cable car ticket includes free return transfers to this beach, so there are open-air shuttle mini buses waiting for you leaving pretty much constantly throughout the day in both directions and it’s only a few minutes’ driving from the cable car station on Hon Thom Island to the beach. Experiencing the cable car is amazing that you get a 360-degree aerial view of the An Thoi Archipelago, flying over green islands, turquoise coral reefs, and charming fishing boats. You can actually look down at the harbor and watch fishermen sailing their boats out to sea. How time the Hon Thom Cable car ride? The cable car ride from Phu Quoc to Hon Thom Island takes about 15 minutes each way, so you have time to really enjoy the amazing views from above. Compared to the average speed of other cable car routes, it is quite fast with the speed up to around 30 km an hour apparently, so you genuinely feel like you’re flying above the water. There are windows in the cabin, so you can get a partial look at the view and take photos at some angles unrestricted by the glass. You should definitely bring a polarising lens for your camera or a clip-on polariser for your phone. A polarizer is just a glass lens you screw onto your camera or clip over your phone’s camera that cuts out reflections on glass or water. Using a polarizer will allow you to get photos of the views through the cable car’s glass walls with less distracting background reflection. How much does the Hon Thom cable car cost? 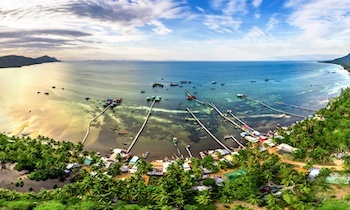 You have to pay 500,000 Vietnamese Dong, which is around £16 / $22 USD for a cable car trip from Phu Quoc to Hon Thom, that is the price for an adult. But there’s a cheaper price of 350,000 VND (£11/$15) for children under 1.3 meters tall and kids under 1 meter tall is totally free. 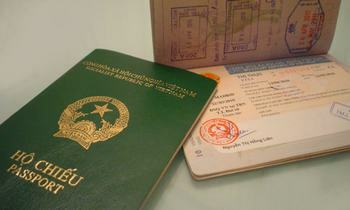 The ticket price is the ticket for both ways and a return shuttle to the beach on Hon Thom Island once you get there. How to get to the cable car in Phu Quoc? The cable car station in Phu Quoc is located in the south of Phu Quoc island. There’s not much in the way of public transport on Phu Quoc island, so you either need to take a taxi, hire a motorbike to get to the cable car station. The taxi ride from Long Beach where most beach resorts and hotels are located, costs around 300,000 VND. Many travelers hire motorbikes to travel although the traffic on Phu Quoc is still pretty hectic, so you only do this if you’re a confident motorbike rider. It’s easy and cheap to rent a motorbike, but if you have an accident and need medical attention, your travel insurance almost certainly won’t cover you if you don’t have a motorcycle license, so make sure you check on this and are aware of the risks! 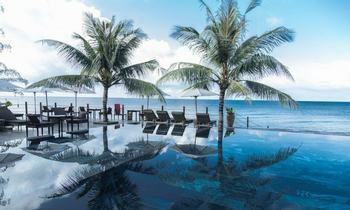 Phu Quoc is the ideal destination for the exciting summer. You will admire the dawn between the season the world's longest cable car. 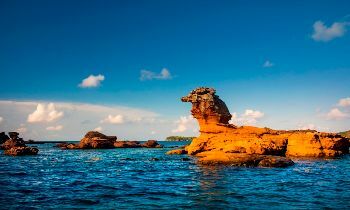 Indulge in the beautiful Hon Thom Island, drop yourself in the green water to explore the vibrant sea game world and meet the ocean with mysterious coral reefs are wonderful and amazing experiences for you.